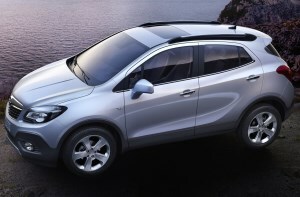 Opel Mokka/Buick Encore. 2012 to date (prod. n/a). 5-door SUV. F/F, F/A, 1364, 1372, 1399, 1598, 1796 cm³ petrol, 1598, 1686 cm³ diesel (I4 DOHC). Gamma II platform-based SUV, related to Daewoo Matiz (M300) and Chevrolet Trax, and built in Korea. Sold as Vauxhall in the UK, and Buick Encore in North America and China. Flex-Fix bicycle carrier slid out from the rear bumper. Inside, not the best fit and finish from the Korean assembly. Comfortable ride and above-average handling, but poor overall performance and harsh. Four-wheel-drive system is on demand, with power to the front wheels till the system detects a loss of traction, upon which 50 per cent is transferred to the rear. Renamed Mokka X in 2016.